You are here: Plumridge and Co Home > Buying Stamps > General Sale No.1989 Catalogue is now available online. General Sale No.1989 Catalogue is now available online. – Lot 1 : King George VI Colonial collection mainly mounted mint with very few gaps. We believe much of the collection was purchased from Plumridge & Co by the vendors late father in 1940’s. Condition is mixed in places but a lovely collection nonetheless including a good showing of India States and New Zealand Arms. – Lot 5 : Commonwealth and Foreign collection that includes a mint British Empire 1935 Silver Jubilee collection in a stockbook. Other interesting items include a small Burma collection on album leaves purchased in Plumridge & Co Sale no. 1724 many years ago. 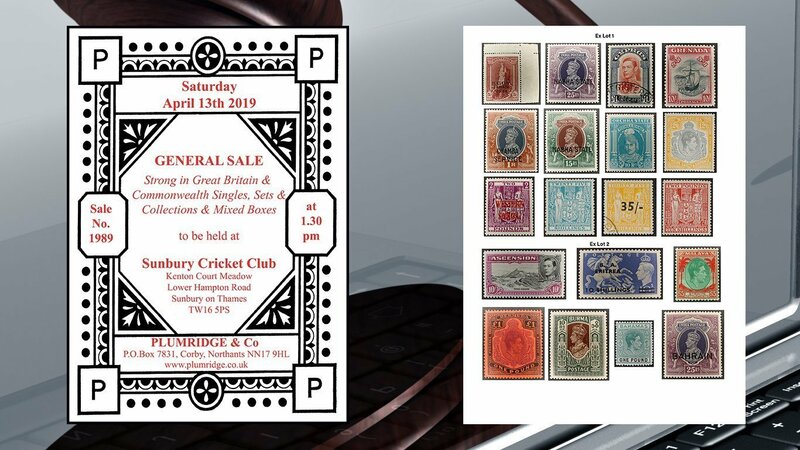 – Single items include Lot 112 Cyprus 1924 £5 black/yellow lightly mounted mint and Lot 347 Sierra Leone 1912/16 £5 orange and green mounted mint. – Our regular customers look forward to the mixed boxes, for example, Lots 15 and 16 offer excellent resale potential as do others. Hard copies were sent out on 23rd March to those already registered on our mailing list. Please email, call or Contact Us if you would like a complimentary copy. Also please find a simple catalogue with lot number, description and estimates below. Columns can be ordered by clicking on the top line and the whole catalogue can be filtered by typing a keyword(s) into the search bar below. To view full details, more images and Bid Live, click on ”View details and Bid” adjacent to the lot of interest. 1 Miscellaneous Lots & Collections 1936/52 K.G.VI COLONIAL coll. mostly mint. Only a few Gaps. presented in 4 new Age albums and a stockbook. Mixed condition in places. View videos of all 4 albums and the stockbook here.